Undoubtedly the most written about assassination in history, John Fitzgerald Kennedy’s death is still hotly debated more than 45 years later. On 21 November 1963, facing a battle for re-election, a need to raise campaign funds and to mend fences with local Democrats, Kennedy and Vice-President Lyndon B. Johnson left for a three-day visit to Texas. At 11.47am on 22 November JFK’s motorcade left for a 17-km (11 mi) journey to the Merchandise Mart where Kennedy was to address a lunch group. 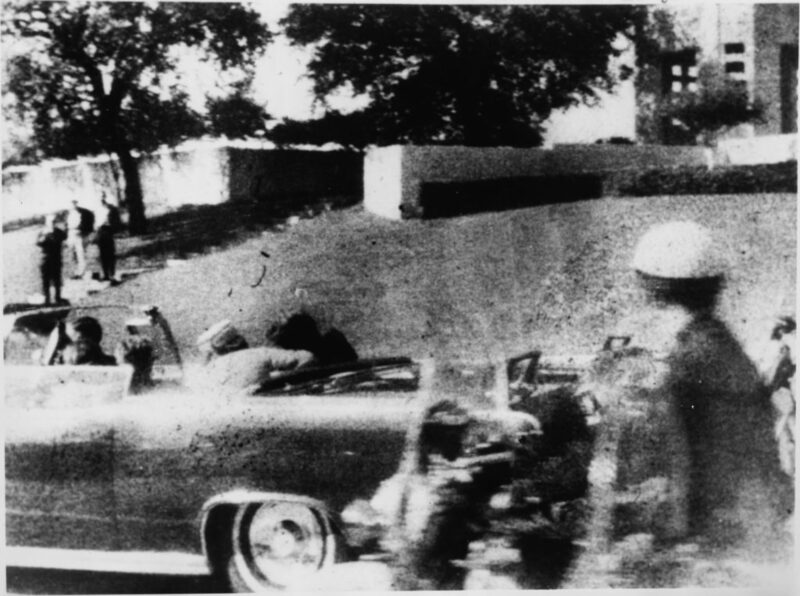 At 12.29pm the motorcade entered Dealey Plaza and, travelling at about 19 kph (12 mph) approached the Texas School Book Depository at 411 Elm Street. The motorcade moved down Elm Street and Nellie Connally, the governor’s wife, said, “Mr President, you certainly can’t say that Dallas doesn’t love you.” At 12.30pm, 24-year-old Lee Harvey Oswald, a former marine, shot Kennedy from the sixth floor window of the depository with a 6.5x52mm Italian Mannlicher-Carcano M91/38 bolt-action rifle with a six-round magazine. The first bullet hit the president’s upper back, penetrating his neck, and exiting his throat before entering Texas Governor John B. Connally’s back, chest and right wrist. Nellie Connally cried out, “My God, they are going to kill us all!” A second bullet missed. As the motorcade passed the John Neely Bryan north pergola concrete structure, a third shot rang out and hit Kennedy in the head, smothering the inside of the car and a nearby motorcycle policeman with blood and brain matter. The First Lady shouted, “Jack! Jack! They’ve killed my husband! I have his brains in my hands!” Special Agent Clint Hifi of the Secret Service, travelling on the car behind, ran and jumped onto the back of the presidential limousine where Mrs Kennedy had scrambled to try and retrieve a piece of the president’s skull. Agent Hill pushed the First Lady back into the car and held on as the car sped to Parkland Memorial Hospital. At 1pm President Kennedy was officially pronounced dead. “We never had any hope of saving his life,” one doctor said. Dallas police surrounded the Texas School Book Depository but Oswald was allowed to leave the scene of the crime after the building superintendent vouched for him. At 1.15pm Oswald shot Dallas policeman J.D. Tippit. There were 12 witnesses to the murder. Oswald walked briskly from the scene into a shoe shop and then a cinema, where he was arrested. Vice-President Johnson took the oath of office at 2.38pm on board Air Force One just before it departed Love Field. The plane then flew back to Andrews Air Force Base carrying the new and the previous chief executive.